The Weider 195 Weight Bench is a high quality bench that includes incline, flat and decline bench positions. The padded Butterfly arm attachments allow for the maximum comfort when working the chest muscles and the Leg Developer provides a padded 4-foam station for leg extensions and curls, to ideally isolate and intensify the resistance on the quads and hamstrings. This bench also features a Rolled Preacher Pad to improve bicep curl technique and effectiveness whilst exercising. 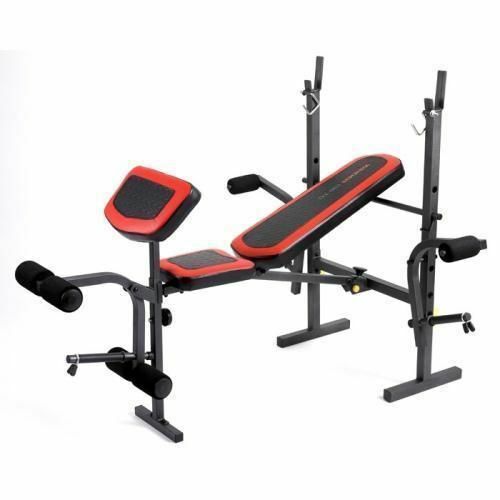 With patented Space Saver technology, a modern design and so many features specifically designed to help improve your workout, this home weight bench is convenient and highly desirable. Designed with over 25 years of strength building experience from the expert engineers at Weider, this quality product is certain to last the test of time and is a must buy for any strength training enthusiast. for submitting product review about Weider 195 Weight Bench.